As tends to happens to me upon reading interesting articles, when I came across this article in relation to shots on target from Ted Knutson yesterday my mind starting to think about what I could prove or disprove. In the data that Ted analysed, shots in the English Premier League on target were much rare than the other 3 leagues he looked at. I wondered (as he did) why that might be, and also if that is the case in the data that I have painstakingly gathered. For those unaware, thanks to Squawka, I have recorded each shot that was taken in the Big 5 leagues for the season just ended. The Big 5 leagues are the top divisions in England, Spain, France, Germany and Italy. So my findings pretty much tally with those of Ted. The German Bundesliga has the greatest proportion of shots that are within the frame of the goal at 35% and England bring up the rear with less than 32% of the shots taken in the Premier League being on target. Those possible explanations don’t exactly break new ground, in fact Mr Knutson came up with those exact same explanations in this article posted on Thursday afternoon. I’m afraid that as a data collector I can’t really offer up anything substantive in terms of proving or disproving the first possible explanation, however, hopefully I (and my data set) can be useful in trying to see if explanations 2 and 3 have any merit. One aspect of the game that I have plenty of data on is shooting positions, so I’m able to investigate the shot locations for each league. Before I do that I’ll explain a little about how I’m going to present the data. Following some feedback on how I was assigning “poor” and “good” shooting locations in previous articles I have come up with the following graphical representation method. Shooting locations have been divided into 4 groupings as shown above. 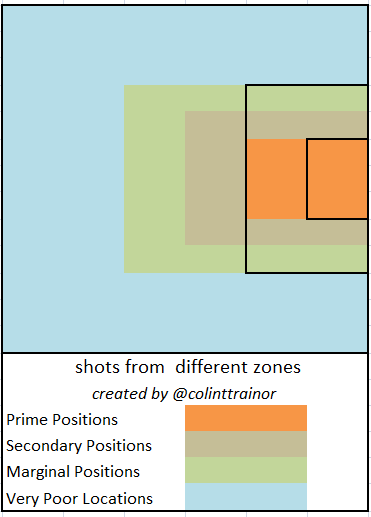 I am not going to tell the readers what the expected percentage of shots on target should be for each grouping, but hopefully the above will be a useful way to compare the shooting locations across each of the leagues. In summary, the farther away from the goal the location the poorer the shooting location becomes. For each country I will also include a much more visually impressive heatmap than the ones I have created. These snazzy heatmaps where created for me by my friend @cchappas. The two styles of viz work well together, as one gives detailed information whilst the other provides a much easier “at a glance” representation of the data. 36% of shots in the Bundesliga this season were taken from the central belt within the penalty area, although I haven’t noted it on the image, 14% of shots were taken from within the 6 yard box. 30% were taken from slightly worse, but still promising, locations and finally just 5% of shots were taken from what I have described as very poor positions, ie far out or beyond the edges of the penalty area. How does the Bundesliga compare with the others? The shot spread in La Liga wasn’t very different to those seen in Germany, at 34% Spain had slightly less shots from the prime central positions. Those few missing percent of shots that came from the central area in Germany were pushed out slightly to the Secondary positions, but other than that it was pretty much as we were. The trend of the slight decrease in shots from Position A continues when we look at the French Ligue 1, this is witnessed by the increase to 5% for shots coming from the worst locations. 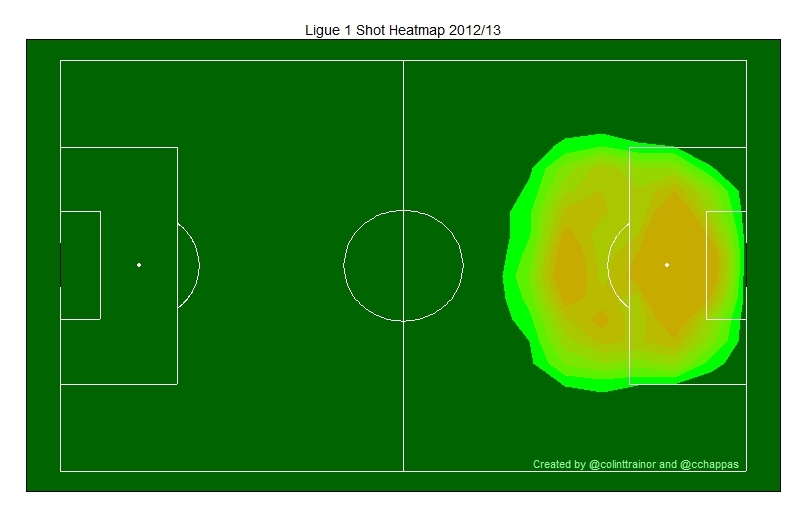 Indeed you can see that the shot distribution is much more even in France than in the leagues we have looked at so far. I am looking at the leagues in descending order of shots that end up on target and the amount of shots taken from prime positions in Serie A is now down to 31%. It’s comforting when the results of a test match the hypothesis that we set out with, ie that the decrease in shots on target can be (at least) attributable to the shot locations. 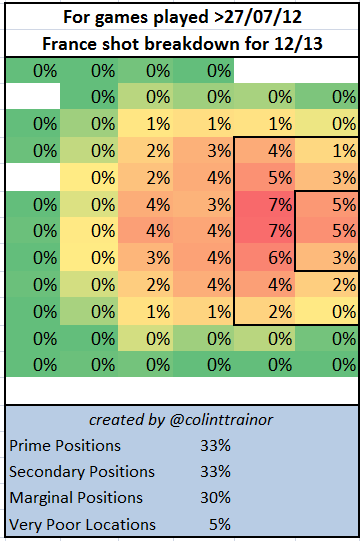 With that in mind, and the fact that the EPL has the lowest percentage of shots on target I wonder will the amount of shots from prime locations in the Premier League fall much below 30%? Wow. What has happened here? 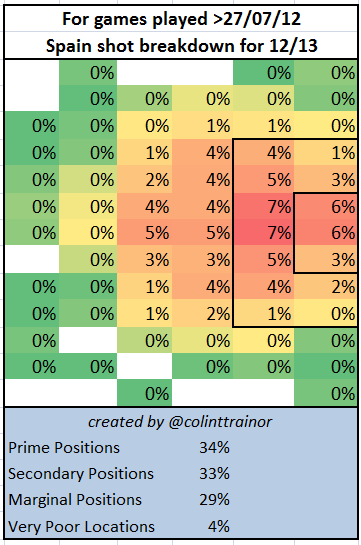 36% of shots in the Premier League came from the best positions. Not only that, but within that figure 15% of shots were from inside the 6 yard box – none of the other leagues posted a higher figure that that. Contrary to what I had expected to see the Premier League actually had shots from better positions than the other leagues. 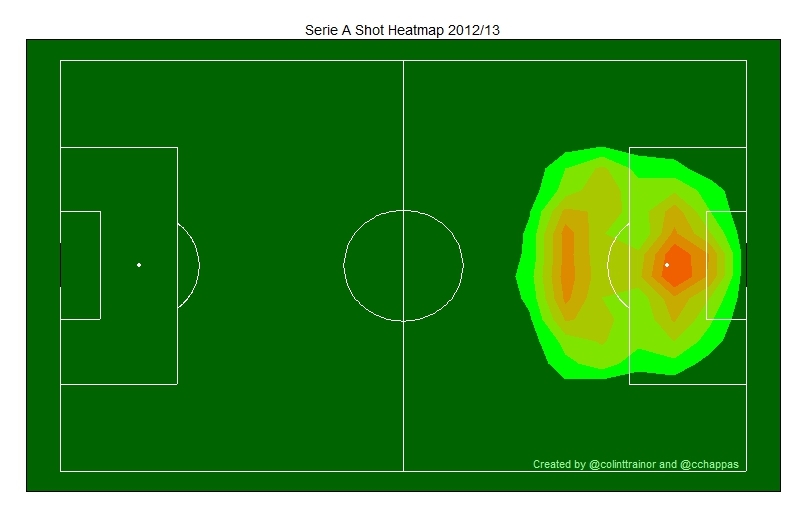 The amount of shots from the secondary position is also exceptionally high at 35%. This leaves just 29% of shots being struck from the two worst zones in the EPL, the next lowest figure was 33%!! 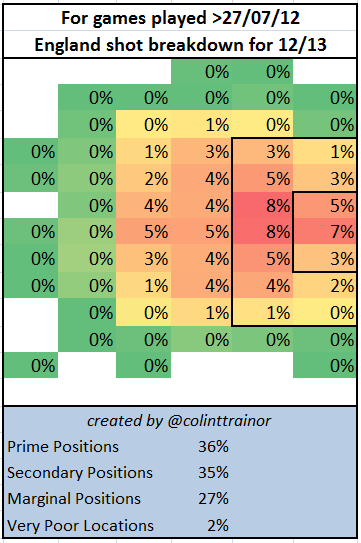 The Premier League clubs will undoubtedly be happy to learn that the players on their books take shots from what appears to be the best positions on the pitch, certainly compared to the other leagues in my data set. Does that mean that my hypothesis of shot location acting as an explanatory variable for explaining the percentage of shots on target in the bin? I don’t think so. Excluding England, there certainly appeared to be a clear pattern where the proportion of shots on target was correlated with the amount of shots that were taken from the more favourable shooting locations. But, given the amount of shots in my data set I don’t think we can ignore the findings from the Premier League. Can we come up with a logical explanation for these findings? If you’re still with me, you may recall that the third and final possible explanation I had in my locker to explain why different leagues had a different amount of shots on target was that of defensive pressure. Presently, and it is a great bugbear of the analytics community, there is no (or virtually no) data available which measures defensive pressure. However, prompted by a few articles by Footballfactman such as this one I realised that we could probably use the amount of blocks as a proxy for defensive pressure. After all, a shot can’t be blocked if the striker isn’t being closed down at the moment they shoot for goal. I looked at the proportion of shots that were blocked this season in each of the Big 5 leagues, and the findings make interesting reading. Perhaps as expected, the Premier League is well clear of the other four leagues in terms of the amount of shots that are blocked. I think we could conclude that there is, indeed, much more pressure on the shooting players in England than there are in the other countries. Perhaps this is because teams tend to play with a higher line in the Continental leagues and allow much more space in behind them, but whatever the explanation the effect is certainly there. In my opinion the amount of pressure on the ball in England is even more stark than the above table shows. 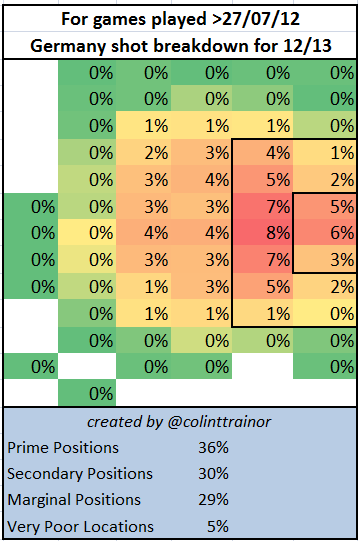 Remember that shots in the Premier League came from better positions on average than the other leagues. In an earlier article where I looked at where blocked shots originated from there was a clear pattern where the amount of shots which were blocked decreased the closer the shots were to the goal. Earlier on in this article we ascertained that the top flight English teams actually had a greater proportion of their shots from those prime locations where blocked shots should have been less of an occurrence. England has 42% of shots from outside the box in the secondary and marginal position zones – and this is where blocked shots occur at the highest rate. However, Spain also has 42%, France 41% and Italy a massive 48% from these zones. 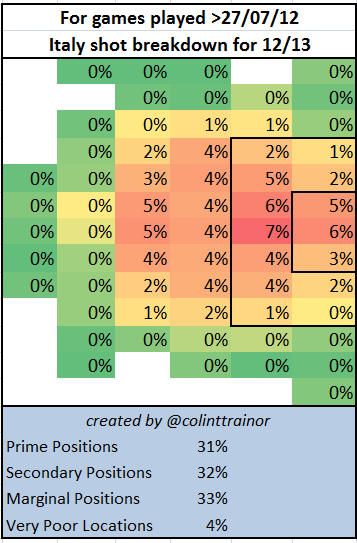 This, combined with the fact that England has more shots than the other leagues from prime positions where blocks are rarer suggests to me that the pressure on both the ball and the attacking players in the Premier League is not even fully captured in the above table of blocked shots. I think this is a very important point for anyone who attempts to undertake analysis of the different leagues. We confirmed that different leagues do have different proportions of shots are on target. There are several different possible explanations for why this could be the case. I didn’t attempt to see whether the first explanation, ie players having different skill levels was plausible, but I think I was able to ascertain that the shot location is an important aspect in explaining whether a shot is going to be on target or not. However, the third possible explanation, that of defensive pressure seemed to have an even stronger explanatory impact than that of shot location and this was starkly seen in the Premier League where the amount of blocks was far in excess of what we might have expected, especially given the shot positions. This entry was posted in Shot Location Information. Bookmark the permalink. I’m considering watching the video of manchester united’s league season to track defensive pressure. Do you any recommendations as to how I should measure this? Also is there anything else you think that would be interesting to track? I would have thought that a “simple” measure such as the number of defenders that are in the penalty area at the time each shot was struck would be incredibly useful. By the way, your blog is excellent; well done. Do you have a twitter handle?